3 Police Officers Found Guilty Of Murder In Philippines' War On Drugs A court found all three men guilty of murder and sentenced them each to 40 years in prison for the 2017 killing of a 17-year-old who police said they suspected was a drug runner. 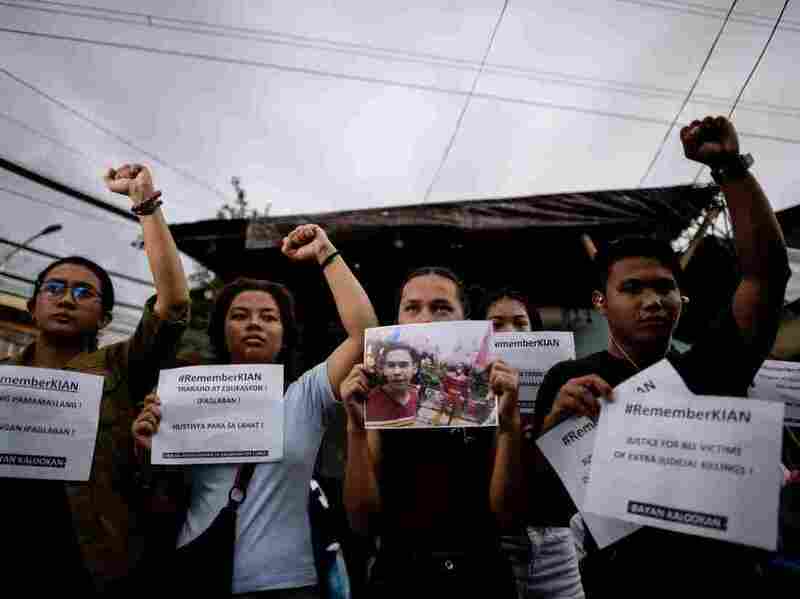 Supporters of Kian delos Santos protest on Thursday outside the police station where three policemen involved in Kian's killing were assigned in Manila. Duterte launched his war on drugs in 2016, promising a campaign to kill every drug user and dealer in the country in an effort to crack down on widespread drug abuse. The Philippine leader has been criticized by international human rights groups for what they view as sanctioning extrajudicial killings, which have been carried out by police officials and vigilantes alike, leaving at least 12,000 people dead. Human Rights Watch has described Duterte's time in power as a "human rights calamity." Santos was shot to death by the policemen in a dank Manila alley in August 2017. Police first reported that the teenager, who they claimed was a drug runner, drew a gun and fired, and that they returned fire in self-defense. The official police photograph of the crime scene showed a gun and packets of methamphetamine next to Santos' body — two bullets in his head — to back up their claim, his uncle Randy Delos Santos told NPR in 2017. The policemen's claim of their victim's alleged drug use is one that's been used thousands of times since 2016 — but this time, neighborhood surveillance footage told a different story. Video showed the three policemen dragging the teenager into an alley, minutes before he was found dead. If the camera hadn't been there, the teenager would have been just another statistic in the war on drugs, his uncle told NPR. "A shoot first, think later attitude can never be countenanced in a civilized society," the judge said on Thursday. 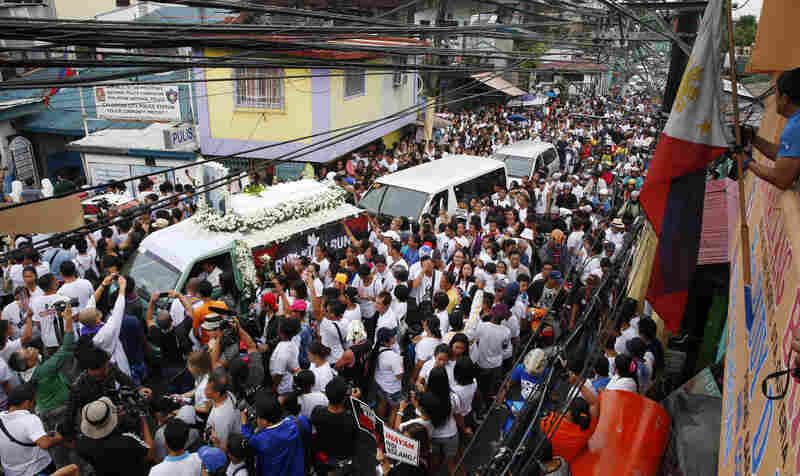 Santos' death sparked an outcry throughout the country. The case "awakened people," Bishop Pablo Virgilio David of Caloocan, near Manila, told NPR in 2017. The teenager was in one of David's parishes. "When I learned about the death of this boy, I asked the parish priest to accompany me to the house. And it's a house in the slums, and they asked me to celebrate mass," David said. "There was no place in the house at all, so we had to celebrate mass in the street. And the streets were full of people." The mood outside the courtroom on Thursday was "one of jubilation," the Philippine Daily Inquirer reported. Santos' parents broke down in tears while two of the police officers reportedly "looked stunned." Human Rights Watch called the decision of the court a "triumph of justice and accountability and a warning to members of the Philippine National Police to respect due process and the rights of civilians as they do their job," the Philippine Star reports. But the group is wary — Duterte has said he will pardon officers convicted in his drug war. "There is reason to suspect that he will keep that promise," Brad Adams, Asia director of HRW, told the Star. Philippines Justice Secretary Menardo Guevarra said the conviction "debunks the myth" there is a culture of impunity in the country's drug war, the Inquirer reported. "One conviction" out of thousands of killings "hardly debunks anything," HRW researcher Carlos H. Conde responded on Twitter. "On contrary, this underscores how broken our justice system is and that so much more needs to be done for justice and accountability," he wrote.